The small conservation village of Bowden is a tranquil spot nestled at the southern slopes of the Eildon Hills and sits just three miles from Melrose, one of the most picturesque towns in the Borders. Here you will find some of the best independent shopping in the area with Melrose Abbey as the stunning backdrop. Melrose (2.5 miles)- has an excellent range of independent shops selling fine quality food and drink including The Country Kitchen for deli produce, cheeses, whole foods and fresh coffees; Dalgetty’s Bakery, makers of the original Selkirk Bannock; Baird’s Butchers for excellent quality and choice locally sourced produce as well as freshly prepared homemade meals which are perfect for holiday stays. You will also find a quality fishmongers, a fresh fruit and veg shop as well as a good sized Co-op supermarket . St Boswells (1.5 miles) – has a wonderful award winning bookshop and deli ‘Main Street Trading’ selling artisan breads, delicious cheeses and indulgent treats and a small R S McColls for everyday essentials. Post Office & Newsagent. Also local produce from the butcher Jennas Meats. Newtown St Boswells (1 mile) – has a good sized co-op for everyday essentials. Newsagent. Galashiels (8 miles) – has larger retailers including a Marks & Spencer Foodhall, 24hr Tesco superstore, a 24hr Asda, and Aldi supermarket. TK Max, Next, Sportdirect etc. For gifts and lovely things, head to Butterfly in Melrose or for beautiful artisan goods from The Crafters – stocked and run by local crafts people. Apples for Jam has beautifully hand painted goods by Button Moon which can be personalised for any recipient. Kelso and Peebles also have an a fantastic selection of excellent quality gift shops, independent clothes retailers and outfitters and art galleries for all budgets and tastes. Just a mile down the road you will find Milestone Garden Centre with its restaurant serving everything from coffees, homemaking and lunches to full Sunday lunch. A couple of miles down the road takes you to Main Street Trading in St Boswells – an award winning book shop with fantastic coffee and cakes to wile away time with your favourite read – also features guest author events – see the website for full details. Round the back of the bookshop you will find their fab award-winning deli selling delicious cheeses, artisan breads and all those indulgences you know you deserve on holiday! For coffee and cake, pop into Apples for Jam in Melrose for a steaming cappuccino and a delicious butter cream sponge, or for evening dining the Town House, Burts or Marmions all come highly recommended. The new Greenhouse Cafe & Restaurant near the Abbey is dog friendly and has lovely outside seating area for dining alfresco. A short drive will also take you to the pretty conservation village of Gattonside (6 miles) for excellent food at Seasons or the Hoebridge Restaurant. Kirkton Cottage, Bowden, Melrose is also a perfect base for exploring the wider attractions of the central Borders area. For sightseeing, the area sits in the heart of myth and legend and visitors come from all over the world to soak up its rich historical connections. A climb up the three peaks of the Eildon Hills for amazing views is a must. There are museums, Abbeys, great independent shops selling local produce and crafts, art galleries and much more across the Scottish Borders. 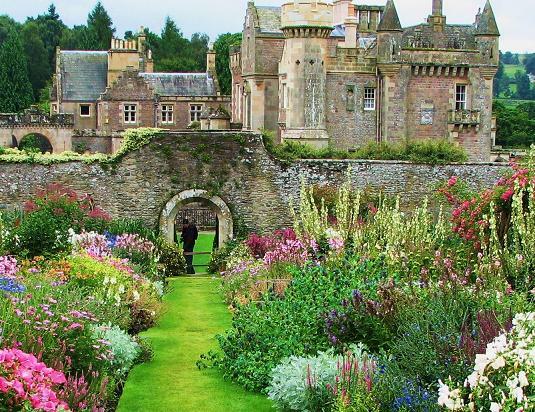 The Scottish Borders has its share of historic and grand stately homes and castles open to the public with their beautifully manicured gardens and treasure troves of paintings and artefacts. After taking in all that history, unwind with a coffee and cake in their on site restaurants and giftshops. From Abbotsford House in Galashiels, the beautiful home of the great writer Sir Walter Scott, Manderston House, Mellerstain House, the magnificent Floors Castle and Thirlestane Castle to name but a few within a short drive, will not fail to impress. The area has a wealth of dog friendly walking routes for all abilities. Melrose is the starting point for St. Cuthbert’s Way which charts the historic trail of this revered seventh century Saint on a 62 mile walk between Melrose Abbey and the Holy Island of Lindisfarne. St Cuthberts Way passes through the village of Bowden where you can begin your ramble from the front door. The area also has the Southern Upland Way, Borders Abbeys Way and Sir Walter Scott’s Way for planned routes. For golf fans, the picturesque 9 hole Melrose Golf Club sits in the shadow of the Eildon Hills while the 18 hole courses at Galashiels and Torwoodlee both sit nearby. Alternatively choose from over 30 courses within a 30 mile radius including the fantastic championship courses at Cardrona in Tweeddale or The Roxburghe at Kelso. Scroll down for more details at the end of this list. For those keen on fishing, the famous Tweed and its tributaries provide the opportunity for salmon, trout and grayling, with notable middle Tweed beats offering some excellent value fishing. Scroll down for more details at the end of this list. For Shooting, just a five minute drive from Kirkton Cottage and you will arrive at Bisley at Braidwood where you can pay and play, sharpen up your eye with a few shooting lessons, or try the first full-bore pipe rifle shooting range in Scotland. There is a restaurant and associated retail units on site. Scroll down for more details at the end of this list. Cyclists will delight at the range of biking options across the wider area from long family friendly forest cruises to high energy burning climbs, including the 7Stanes biking centres at Innerleithen and Glentress which are just a half-hour drive away. Haven’t brought your bike ? If you would like to hire a bike during your stay, Steve Diamond Cycles, provider of quality bikes in Galashiels can deliver to the cottage door and uplift again before you leave. https://www.stevediamondcycles.co.uk. Scroll down for more details at the end of this list. Go Ape at Glentress,Peebles provides some mid-air challenges as you negotiate the routes through the forest canopy and zip slide your way back down to the ground. Not for the faint hearted! Scroll down for more details at the end of this list. For families, there is a small play park and football pitch just along the street from the cottage. You will find a bigger playpark and tennis courts in nearby Melrose, a multi-screen cinema, skate park and swimming pool in Galashiels (7 miles), Hawick Leisure Centre (16 miles) or try the wonderful forest adventure playground with huge slides and zip wires at Bowhill House and Country Estate (10 miles). The Borders Donkey Sanctuary is just 2 miles down the road and is open to the public at 2pm on weekends for a chance to meet and feed these lovely rescued Donkeys (seasonal). The coast is an hours drive away. The best beach is at Ross Sands nestling between Holy Island and Bamburgh in Northumbria. You can get boat trips from Seahouses just down the road from Bamburgh out to the Farne Islands for bird and seal watching. Bamburgh itself has the RNLI Grace Darling Museum dedicated to Grace Darling and her family as well as those who save lives at sea. There is also the magnificent Bamburgh Castle perched proud overlooking the sea. In the Scottish Borders Eyemouth has a busy harbour and maritime museum. Within an hours drive there is a wide selection of activities including diving, surfing, sea fishing, and of course, sandcastle building! East Lothian has some beautiful stretches of sandy beaches and bays. A must for families is Eastlinks Family Farm Park, a full days entertainment right beside the beach at Dunbar. There is a multi-screen cinema just 10 minutes away by car in Galashiels. There will be a printed copy of film listings & times covering the period of your stay left for your information in the cottage. See our Activities & Events Page for Race dates. For those wishing to venture to Scotlands capital city (a must if you haven’t been before) there is a train station at Tweedbank near Galashiels just a 10 minute drive from Kirkton Cottage where there is ample free parking available. You can also pick up a hot drink and tasty snack for the journey at the new ‘Born In The Borders” snack cabin at Tweedbank Station. The train takes you directly to the centre of Edinburgh in 55 minutes through scenic countryside. The fabulous National Museum of Scotland is free (charges for some special exhibitions) and just a short walk from the Waverley Station. The Scottish National Gallery is also just a short stroll along Princes Street and is free (charges for some special exhibitions). The famous Royal Mile leading uphill to the magnificent Edinburgh Castle and Camera Obscura, and downhill to Holyrood Palace, Holyrood Park and Dynamic Earth – great for families. All are within a short walk of the station. Travel with the kids, for just a quid with Scotrail. Travelling with the kids won’t cost the earth when you book your Kids for a Quid ticket and travel at the weekend or on any off-peak service. For every paying adult, up to four children can travel for just £1 return each making exploring with the family great value for money. From Edinburgh Zoo to Glasgow Snow Factor, RRS Discovery to Aberdeen Science Centre… Check out the incredible places you can visit and enjoy great value days out, all year round. https://www.scotrail.co.uk for prices and terms & conditions. For those looking for something a bit more relaxing, why not book a spa day at one of the beautiful locations across the region including the superb Stobo Castle Health Spa, west of Peebles. Closer to home, there is Dryburgh Abbey Hotel just a few miles down the road from Kirkton Cottage with its Spa and small swimming pool – take a swim and a spot of lunch – perfect for passing a relaxing day in beautiful surroundings. The newly opened Greenhouse Cafe next to the Abbey carpark in Melrose – dog friendly (water bowls provided) inside and lovely outside seating area to watch the world go by (open 8am-6pm). Lovely view of the Abbey. Gardens and grounds, walks and cycle trails, Castle tours – lots to do and great food too ! Dog friendly outdoors – see the website for details. Cocoa Black Chocolate Boutique, in beautiful Peebles – an absolute must for chocoholics. This ‘coffee shop’ was opened by the local chocolatier and allows you to totally indulge your sweet tooth. You can also book ahead for the Chocolate & Pastry School. With classes and recipes developed by Ruth Hinks, the school provides tuition for all levels from beginner to professional. Whether you’re looking to spend a lazy afternoon preparing French patisserie, a chef seeking to develop your pastry section, or are training for international culinary competition we have a course to suit. Well worth the scenic 20 mile journey with lots of lovely independent shops and Galleries there too. These are just a few of the many fine places to eat in the area. Please ask us if you would like further advice. Buy the pass and save money out and about at great attractions. The Midlothian and Scottish Borders Sightseeing Pass is valid for either one or two calendar days depending on which option you decide.. Your pass is activated upon entry to the first attraction so it’s important to get an early start. We provide you with either a digital or physical pass (you decide) including an overview of which attractions you can visit. The Pass can be used anytime from the 21st of May until the end of October 2018. Jump in the car or take the train or bus and explore the Scottish landscape which inspired writer Sir Walter Scott. 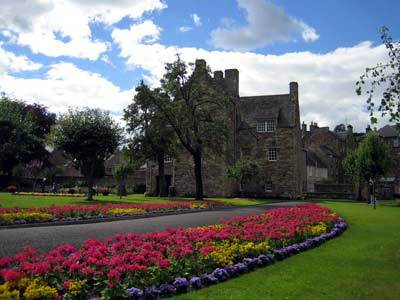 The Sightseeing Pass includes free access to well known attractions along the way including Rosslyn Chapel, Abbotsford – the home of Sir Walter Scott – the National Mining Museum Scotland, Butterfly & Insect World, Trimontium Roman Museum and the Scottish Borders Open Top Bus Tour which runs from Galashiels. Save on dining, shopping and other experiences with your Beyond Edinburgh Sightseeing Pass. To take advantage of these exclusive Beyond Edinburgh discounts simply show your pass at the payment point in a shop, attraction or restaurant. See the link below for venues and discounts. The area is a perfect base for exploring the wider attractions of the central Borders area. For sightseeing, the area sits in the heart of myth and legend and visitors come from all over the world to soak up its rich historical connections. Top of the list is the magnificent monastic ruins of Melrose Abbey founded in 1136 by the monks of the Cistercian order, featuring beautiful architectural detailing and fascinating connections to St. Cuthbert, Scottish Kings, and the philosopher wizard. Nearby you can enjoy the peaceful surroundings of the Harmony Garden and Priorwood Garden before a visit to the Three Hills Roman Heritage Centre based in the town square. Next, stop for a lazy lunch and leisurely browse at the very lovely award-winning bookshop and artisan deli – Main Street Trading in St Boswells (the coffee is fab), followed perhaps by a trek up the three peaks of the Eildon Hills for yet more amazing views and fascinating historical connections. The grand castles and stately homes and gardens of nearby Bowhill House, Traquair House, Manderston House, Mellerstain House, Paxton House, Floors Castle and Thirlestane Castle will not fail to impress. Check the websites for seasonal opening times, special events and lots more fascinating information about each venue . This majestic House and its grounds have been the centre of life in this rural oasis for more than 200 years. Bowhill enjoys a regal seat in the heart of the ancient royal hunting forest of Ettrick and is blessed with an abundance of glorious scenery. For outdoor activities, family days out, House tours full of history and art, you’ll find this is a truly magical place. It even has its own historic theatre with performances throughout the year. Make it top of your list of places to see in the Borders and you won’t be disappointed. Fantastic walks for all levels, children woodland playground and bookable events like ranger led activities, pond-dipping etc. NEW for visitors in 2017 is the chance to see rare Victorian artefacts in Bowhill’s new exhibition space. Entitled ‘Love and Respect in the Victorian Age’, it will showcase a range of around 70 items including silver, porcelain, jewellery, books and manuscripts, paintings and miniatures. Traquair House is Scotlands oldest inhabited house and spans over 900years ofScottish History. Strong associations with Mary Queen of Scots and the Jacobites as well as the famous Traquair House Brewery which lies in one of the wings of the house. At the rear of the house lies the largest hedged maze in Scotland. There are extensive grounds and woodlands, craft workshops, a restaurant, gift shop and brewery shop. Visited by 27 Scottish Kings and Queens Traquair dates back to 1107 and has been lived in by the Stuart family since 1491. Traquair House Brewery lies in the wing of the house directly underneath the Chapel. It dates back to the early 1700’s and was originally a domestic brewery serving the house and the estate. It was disused in the early 1800’s but never dismantled. It gradually filled with the family junk until it was completely forgotten. Peter Maxwell Stuart rediscovered the brewery in the early 1960’s and began brewing again as an experiment in 1965 using all the original equipment and fermenting the ales in the original oak tuns, some of which were over 200 years old. Footage has recently come to light showing the 20th Laird brewing with his daughter (the present 21st Lady of Traquair). In the 1970’s the Campaign for Real Ale became an important consumer movement that revived and interest in traditional beer and championed small independent breweries. Traquair was rightfully recognised as a pioneer in its field and demand for the ale increased. Commemorative brews were produced such as the 100th Brew, the 250th, Silver Wedding Ale and even a 21st Birthday for Peter’s daughter Catherine. In the mid 1980’s the first brewer was employed and the first exports undertaken to the USA closely followed by Japan. In 1990 following my father’s death I took over the management of the brewery. Demand for the ales continued to grow both in the UK and overseas and in 1993 the brewery was expanded into the adjoining stable block which doubled the production capacity. The brewery now employs two full time brewers who brew twice weekly with a weekly output of around 500 gallons. The recipe has not changed and ingredients are sourced locally where possible. The exception is the hops which are East Kent Goldings, a rare and old fashioned variety. 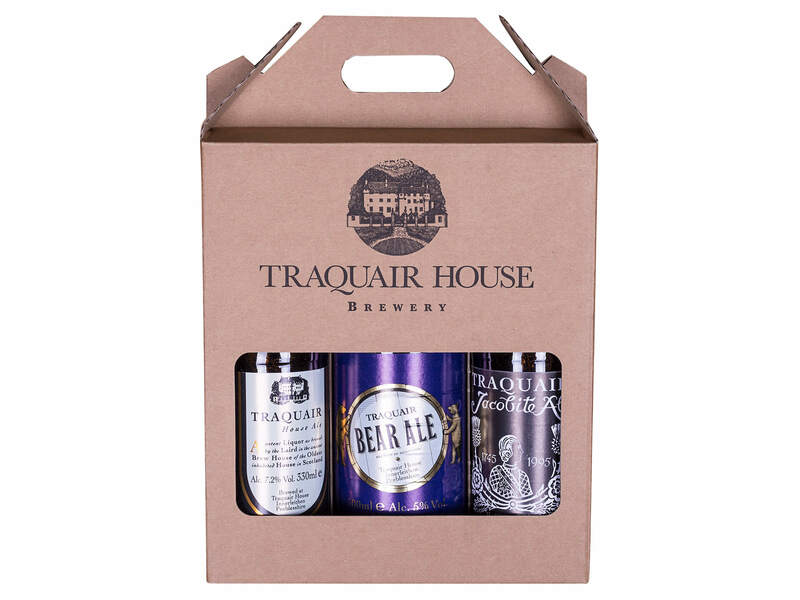 The original ale produced was The Traquair House Ale (ABV 7.2%). This has now been joined by the Traquair Jacobite Ale (ABV 8%) which is spiced with coriander and based on an eighteenth century recipe. Traquair Bear Ale (ABV 5%) which is the lightest in the range and is also sold on draught locally and in Edinburgh. The brewery now produces around 250,000 bottles each year and approximately 60% is exported to the USA, Canada, Japan, Italy, Denmark, Finland and Sweden. The ales have won numerous awards and in a few years ago the brewery was voted 20th best brewery in the world by the consumer website ratebeer.com a real tribute to the quality of the ales produced from this tiny brewery. The gardens and grounds at Floors are a delight to explore. Combining one of the finest Victorian kitchen gardens in the spectacular Walled Garden with the formal Millennium Garden, the gardens at Floors are a showpiece of seasonal interest and inspired new creations. Enjoy the frenzy of colour in the breath-taking herbaceous borders, explore the glasshouses bursting with soft fruit or take time to stroll through the Millennium garden featuring a French-style parterre and also a charming summerhouse known as Queen’s House after Queen Victoria’s visit in 1867. With a flying fox, swings and monkey bars to name but a few, the children really will have a ball! The lawn is surrounded by benches so you can sit back, relax and watch the children tire themselves out. Discover Abbotsford, the home of Sir Walter Scott – one of Scotland’s most fascinating places. Sir Walter Scott’s home at Abbotsford at Tweedbank, Galashiels just a 10 minute drive away from Kirkton Cottage will reveal a treasure trove of artefacts connected to this great writer and is well worth a visit. There is also the visitor centre and restaurant on site. Explore the historic house and discover a treasure trove of intriguing objects and unusual artefacts which inspired Scott’s greatest poems and novels. Learn about Scott’s life and achievements, browse the gift shop, dine in style in our restaurant or simply relax and unwind as you wander through the beautiful formal gardens and tranquil woodlands. 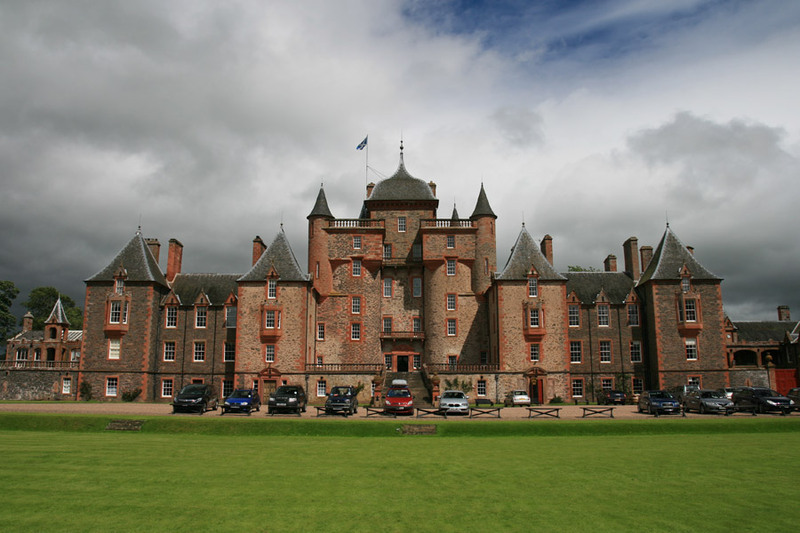 Family Home to the Duke of Lauderdale, Thirlestane Castle is one of the oldest and finest castles in Scotland and still remains home to the Maitland family today. The history of Thirlestane dates back to at least the 14th century, when a large Border fort was built on the site to defend the approach to Edinburgh from the south. The central part of the present castle was completed in 1590, remodelled in the 1670s, and then again in the 1840s. Located just off the A68 in Lauder, Thirlestane Castle is easily accessible and has plenty of parking. There are twelve museums spread across the Scottish Borders – each offering a unique insight into Borders’ history, people and culture. There is something for everyone from archaeology to art, hosiery to history, jumpers to jailbirds and mini beasts to Mary Queen of Scots. Find out more about our ever-changing exhibitions, events, opening times, workshops and activities programme in the directory of our museums. Download our Museums and Galleries guide for more information. For further information including enquiries regarding museum and art collections please contact us. Mary, Queen of Scots Visitor Centre, a late 16th century tower house in the centre of historic Jedburgh, reflects the proud association of the town with ‘Queen Mary,’ who stayed here in 1566. A wonderful collection of objects associated with Mary has been gathered and put on show, reflecting the cult that has grown up around her. Each room has a different focus. The Rogues’ Gallery introduces the individuals in the drama of Mary’s life, whilst the Last Letter Room reveals Mary’s final thoughts. The period feel inside the house has been preserved, while thoughtful design allows the story of Mary’s life to be told in a lively way. The building was bought in 1927 by the town of Jedburgh as it had always been linked with Mary’s stay here on an official tour in October, 1566. This visit was when she became seriously ill after riding to Hermitage Castle to visit Bothwell, her supposed lover. Mary, Queen of Scots’ House is a museum in Jedburgh devoted to Marie Stuart opened in 1987, on the 400th anniversary of her death. Although there is some debate as to whether this was indeed the fortified house she was taken to, it is believed that she stayed here, where she was gravely ill after riding 30 miles to Hermitage and back in one day to visit James Hepburn, the Earl of Bothwell who was himself seriously wounded, and falling into a bog on the way home. This house belonged to the Kerrs of nearby Ferniehirst Castle (where it is likely she may have been cared for instead). The house has an interesting feature, a left-handed staircase built for the Kerrs (who were left-handed) in the 16th century, to enable them to wield their sword more easily. Jedburgh Castle Jail gives visitors a taste of what life was like in an 1820s prison, whilst also telling the story of the Royal Burgh of Jedburgh. The main building of Jedburgh Castle Jail is home to the museum collection of the town of Jedburgh. The focus of the exhibitions are on traditions, industries and important individuals of this historic Scottish town, with historical artefacts, prints and paintings and a temporary exhibition space. You can walk through the original cell blocks of this Georgian jail – the finest remaining Howard reform prison in Scotland. Children can dress up and enjoy activities. Situated in the affable town of Jedburgh here in the Scottish Borders. By day you are welcomed into a cosy cool interior flooded with light, capturing the essence of the original building. As the evening draws in you are seduced into sitting down and relaxing with a drink chosen from our extensive drinks or wine list in our candle lit lounge. For walking, Melrose is the starting point for St. Cuthbert’s Way which charts the historic trail of this revered seventh century Saint on a 62 mile walk between Melrose Abbey where he started his religious life and his eventual resting place on the mystical Holy Island of Lindisfarne. Alternatively the sublime Southern Upland Way, Borders Abbeys Way and Sir Walter Scott’s Way run right through this area – each with shorter routes for less experienced walkers or those with less time. The views from the top of the Eildon hills are a must – and they are literally right on our doorstep. Fantastic dog-friendly walks to suit all ages and abilities directly from the cottage. For golf fans, the picturesque 9 hole Melrose Golf Club sits in the shadow of the Eildon Hills just a few minutes drive from the cottage, likewise 2 miles down the road at St Boswells is a flat beautiful riverside course on the banks of the Tweed. The 18 hole course at Galashiels’ Torwoodlee Golf Club is also nearby. Choose from over 30 courses within a 30 mile radius including the fantastic championship courses at Cardrona in Tweeddale or The Roxburghe at Kelso. If your passion is country sports, the famous Tweed and its tributaries provide the opportunity for salmon, trout and grayling, with notable middle Tweed beats offering some excellent value fishing. Shooting, be it clays or game, can be arranged locally including nearby Bisley at Braidwood just over a mile along the road where you can pay and play, sharpen up your eye with a few shooting lessons, or try the first full-bore pipe rifle shooting range in Scotland. Borders Gunroom just a couple of miles down the road in St Boswells are renowned for their knowledge of local country sports and are stockists of shooting and fishing clothing and equipment. LEVEL DETAILS – Longer distance or on hilly roads. May enter remote areas. High degree of self sufficiency required. click the link below for full details and a route map etc. The 7stanes are world-class mountain biking centres that span the south of Scotland. We have our very own just 20 miles drive from the cottage through beautiful countryside in the Action-packed Glentress Forest. Their award-winning trails offer some of the best mountain biking in the country and attract riders from all over the UK and beyond. There’s secure outside storage at the cottage for your bikes when you’re not using them, or you can hire bikes at Glentress – click the link below for lots more info. The Dryburgh statue was the first monument to be raised to Wallace in Scotland. The eleventh Earl of Buchan was very attached to the Dryburgh area and this nobleman was himself buried at Dryburgh. He built a 260 foot suspension bridge over the river Tweed here and also commissioned a colossal statue of Wallace to be built. This statue was placed on its pedestal on 22nd September 1814. It stands 21.5 feet high and is formed of red sandstone. When first raised it was painted white, but is now bare sandstone. The statue was designed by a Mr John Smith, a self-taught sculptor, and he had copied its likeness from a supposed authentic portrait which had been purchased in France by a Sir Philip Ainslie of Pilton. Wallace is represented in ancient Scottish armour, a shield hanging from his left hand, and leaning on a huge sword with his right. An urn in front of the statue bore what old accounts called ‘a suitable inscription’. This is illegible in parts now due to erosion. The remaining words nevertheless convey the spirit of the piece. The statue can be found by following the Dryburgh road from St. Boswells (signed). Soon after the road crosses the river Tweed there is a side road on the left with a sign for the ‘Wallace Statue’. The road is then signposted all the way to the car park for the statue. It is a five minute walk through the woods from the car park to the statue. The sheer scale of the statue is only appreciated when you are standing close to it. The setting is absolutely magnificent, on the edge of a steep drop down towards the river Tweed. The spot is very peaceful with lovely views to the North and West, and is ideal for a picnic. There is a footpath leading down from the front of the statue, first towards the East then turning Westwards to run down through woods to the join the roadway near the entrance to Dryburgh Abbey, burial place of Sir Walter Scott. The turn-off from this road on the right, just before the entrance to the Dryburgh Abbey Hotel, leads down past an amazing stone gateway (presumably once leading to part of the Earl of Buchan’s estates) and then then along the riverside to the Earl’s suspension bridge over the Tweed. Just off the path at the Southern end of the bridge, almost completely hidden in bushes, is a circular red sandstone plinth with columns and a sandstone roof (again presumably the work of the Earl of Buchan). Across the bridge and along the riverbank to the West for about 150 yards is a gravel beach, used by local people for subathing and swimming on hot summer days. A great place for walking dogs. Born in the Borders is an extraordinary new visitor centre located next to the Scottish Borders Brewery. Set on the banks of the River Teviot, it brings together the best of everything that is grown, made, spun, produced, cooked and created in the area. With a food and drink shop, a goods and gifts shop, a stunning cafe and restaurant, riverside walks, picnic spots and brewery tours, there’s no better way to discover the incredible wealth of products and goods our amazing region has to offer. So whether you are coming for the shopping, the delicious food, or just a meander around our beautiful parkland, you’ll find that Born in the Borders opens up a world of local possibilities. Brewery – The Born in the Borders Brewery is a multi-award winning microbrewery creating real ale using barley grown in the neighbouring fields. Founded in 2011, and originally known as the Scottish Borders Brewery, the brewery distributes in cask and bottle across the UK, and its strong “plough to pint” ethos has seen it grow rapidly. Beers include Foxy Blonde, Game Bird, Holy Cow, Dark Horse, Flower of Scotland and Gold Dust, and the brewery also runs a unique project called Wild Harvest, which uses locally foraged ingredients to flavour a separate range of beers. Self-guided walk-around tours of the brewery are available all the time for no charge, and groups and special events can also be catered for. Distillery – They distill their Lilliard Gin in small batches in a beautiful copper still, and their botanicals have been carefully selected to represent the lush abundance of the rolling Scottish Borders countryside. Rowan, rosehip, meadowsweet and elderflower combine with juniper to create an elegant, floral gin that embodies the four fragrant seasons of the Border valleys. Ospreys watch the amazing resident Ospreys and chicks in their nest from the CCTV footage streamed live on site. All year, all weather … enjoy 30 minutes of exhilarating sledging on the perfect grass slope. Suitable for children 5 years and over up to adult age! We would advise that younger children are carefully overseen by parents. Each booking includes the use of a grass sledge, a helmet and other protective gear. Sledging & skating is available at weekends only, and then everyday during the school holidays. To avoid disappointment, book online before you visit. 30 minutes sessions cost just £5. Let us show you around our fantastic site and take you through our mashing, fermentation and distillation halls, and learn about the design and operation of our distillery. Our guided tour takes approximately 40 minutes, finishing with a dram in our gallery. Tours bookable online. Beautiful countryside and a great outdoor play park mean there’s always lots to do, whatever the weather. Discover why Harestanes is one of the Borders’ best-loved attractions. Access routes and neighbouring craft businesses are open all year. Crafts businesses at Harestanes operate separately from the visitor centre and their opening times may differ from the visitor centre. Events and exhibitions – There’s a full programme of outdoor and indoor events and exhibitions from April to October. Walking and cycling – Discover the local countryside on foot and by bike. Harestanes has a range of waymarked paths including St Cuthbert’s Way, one of the country’s most popular long-distance trails. A network of quiet public roads provides options for cyclists, including the popular 4 Abbeys Route. Facilities –Free public Wifi. Gift shop. Toilets. Café –Savour the taste of freshly-ground FairTrade coffee with delicious scones and traybakes from the café. Go Ape is Scotland’s No.1 Tree Top Adventure. Just 20 mile away from the cottage tucked away in Glentress Forest is the fabulous, not for the faint-hearted, Go Ape treetop adventure. Built on the hillside within the beautiful Glentress Forest, Go Ape Peebles adventure makes good use of the valley for some jaw dropping exposure, and features the highest zip-wire over the reservoirs in the valley. Head to Glentress Forest, Peebles for two to three hours of fun in the trees, taking on the highest Zip Wires, Tarzan Swings, Rope Ladders and a variety of Obstacles and Crossings, including the thrilling Skateboard Zip. Anyone can Go Ape. It’s best enjoyed with friends and family. Great for a special day out with the kids. I’m terrified of heights but I did it. I screamed a bit on the huge zip-wire and no wonder -it’s Go-Apes highest at 48metres above ground level looking down on the forest and reservoirs. It was fab ! A really great day out for anyone age 10+. Just a 40 minute drive away takes you to the fabulous indoor facility that is Ryze. Perfect for a wet weather activity (maybe coupled with a visit to the Mining Museum just 5 minutes down the hill). The huge indoor park has loads to offer – trampolining, an all-wheel ramped park – bring your scooter, skateboard, bmx (and helmet!). Theres also a cafe selling lots of treats and goodies and a soft play for the younger ones, climbing walls, dodgeball, the list is endless – for full details and photos to tempt you, click on the link below. Suitable from toddlers to adults – something exciting for everyone. Great for a wet days entertainment! Great for adults and children. Either a 40 minute drive or a leisurely 25 minute trip on the train from Tweedbank will take you to this amazing museum. The Lady Victoria Colliery, home of the National Mining Museum Scotland was opened in 1895 as Scotland’s first super-pit. It ceased production in 1981 and now serves as an example of one of the best preserved Victorian Collieries in Europe. The four-acre Midlothian site effectively captures the developments in mining over generations and highlights include the most powerful steam winding engine in Scotland, the most extensive preserved suite of Lancashire Boilers in the UK and the only extant timber Dredger in Europe. A tour of the Pithead, recreated underground roadway and coalface with an ex-miner as your guide and experience the atmosphere and noise of a working pit. 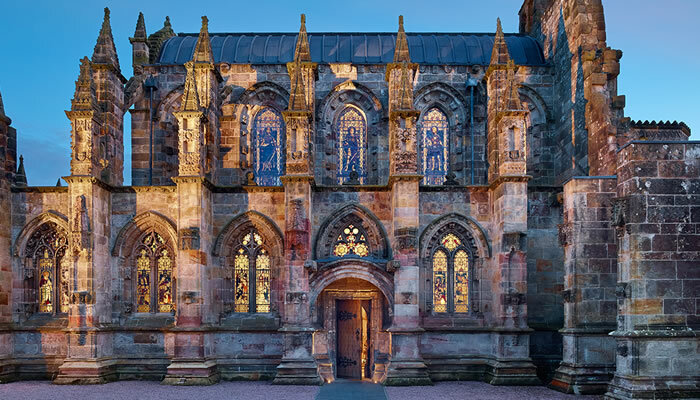 Rosslyn Chapel was founded in 1446 as a place of worship and services continue to be held weekly. 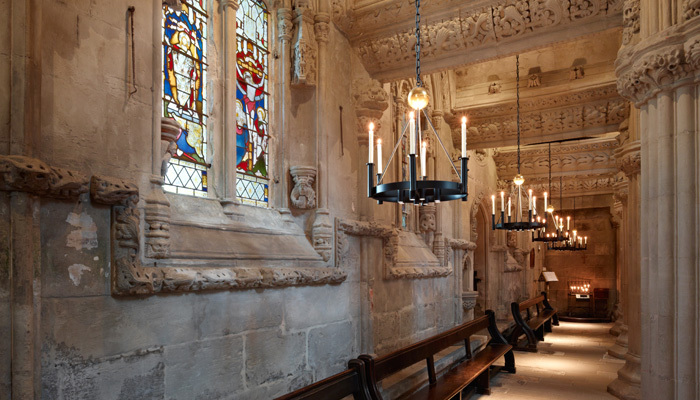 The chapel has also been a popular destination for visitors for generations and had around 175,000 visitors last year. Its popularity soared after the publication of Dan Browns novel, The Da Vinci Code, in 2003 and the later Hollywood blockbuster film in which the Chapel features – you can read the book and watch the DVD in the cottage before you go! There is also a state of the art visitor centre, coffee shop and gift shop. For full details click the link below.